Experience modern Japanese cuisine, sushi and sake at Michelin Three-Star Chef Masa Takayama’s first Las Vegas venue. Continuing the tradition that has made his New York restaurant legendary, Chef Masa allows the inherent flavors of each ingredient to emerge undisguised. Key ingredients are flown in directly from Japan. Wide selections of sakes and wine have been handpicked to perfectly complement the seasonal menu. It was not good. It doesn’t deserve a five star review. The service is bad. Servers should not laugh at their customers just simply because the customers are from foreign country and doesn’t understand you sometime. Food is not fabulous, or anything I except for a good, famous restaurant. Goôd Japanese restaurant but found the food average with very high prices. Food was very good, service was weird. The waitress/order taker had did not even seem to be paying attention and was impatient even though the place was only about 25% full on a Saturday evening at 8:30. The serve ring assistant, keep trying to take plates away that still had food on them while we were still eating. I finally had to tell him to back-off. Service was superb! Wait staff was helpful with recommendations and the wine pairing was spot on! We stayed in the Aria and we didnt want to venture out our first night there. We were very pkeasantly surprised at excellent food and service. We’ve been to this restaurant several times and each time the service and food is outstanding. We look forward to coming back. We we're recommended here by the front desk staff. The whole experience was a little underwhelming for the cost of the dishes. The atmosphere resembles that of a large Warehouse then a high-end restaurant. Nothing really spectacular to be said about the decor. Our service however, was the highlight of the experience. With the exception of the duck rice...the food was mediocre at best. Exactly what you’d expect - excellent service. Very good but maybe not great food but in a cool atmosphere. Super pricey but no surprise there. I’d go again. I was a little disappointed to have missed out on a tasting menu that originally drew me into the restaurant in the first place, but my bartender/waitress Susan was amazing. She helped walk me through everything giving recommendations based on what I told her I wanted to get out of the dining experience. My experience would not have been as wonderful without her being there! 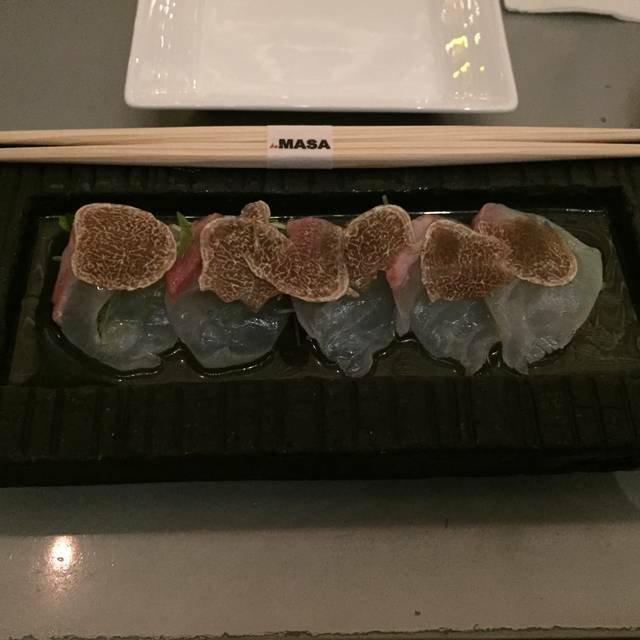 The Tai Truffle and other seasonal sushi was very fresh and melted in your mouth. The menu portions were a wonderful size for me, not too big where I could only try one or two things, but big enough to share with another person, if needed. I highly recommend the Peking Duck Tacos! I thought certain things were a little outrageously priced, but I knew going in that I was going to end up spending over $300. I would stick to sushi versus the special maki and try as many hot and cold plates as you can eat, since the chef excels at fusion. When I wanted a traditional Japanese style something, I was a bit disappointed, but not because the dish did not work; it was just different than what I was craving. For example, the lobster miso soup was more reminiscent of a buttery summer soup you would try in New England, rather than your traditional miso. After getting Open Table's last reservation, I was surprised that the restaurant was dead (odd for a Thursday night in Vegas). Because of this, I chose to sit at the bar, but I think I would forego sitting anywhere else. You get to overlook the entire restaurant and people watch. If you can't get a reservation online or calling, I would try going to the restaurant, because there were a ton of no-shows. I was also surprised to see that this restaurant shared its space with another, but kept completely separate menus. Overall I am happy with my experience at Bar Masa and look forward to my next visit. Any of their Wagyu beef dishes melts in your mouth. The fish is flown in every day, so the sushi is superb. The next time you eat sushi you will notice a difference. Wait staff was friendly and helpful, especially since we weren't sake connoisseurs. We definitely enjoyed our food and the fact that even though it was a large space, we had ample space between tables to make our conversation still feel semi-private. Just MEH... food. Prices are pretty ridiculous (but it is Vegas). Wouldn't go back. Absolutely one of my favorite sushi restaurants in the world!! The Masa Toro Toro roll is exquisite!!! Sushi and other entrees were much smaller and not as good as the Japanese grocery store back home. Not worth the cost. They did not even provide the hot hand towels. The shrimp tempura was thinner than my finger and I am petite. They also did not provide and tempura vegetables. We have loved all the other restaurants at Aria but do not recommend this one. I have been to BarMasa when it's at it's best, this occasion was extremely lackluster. 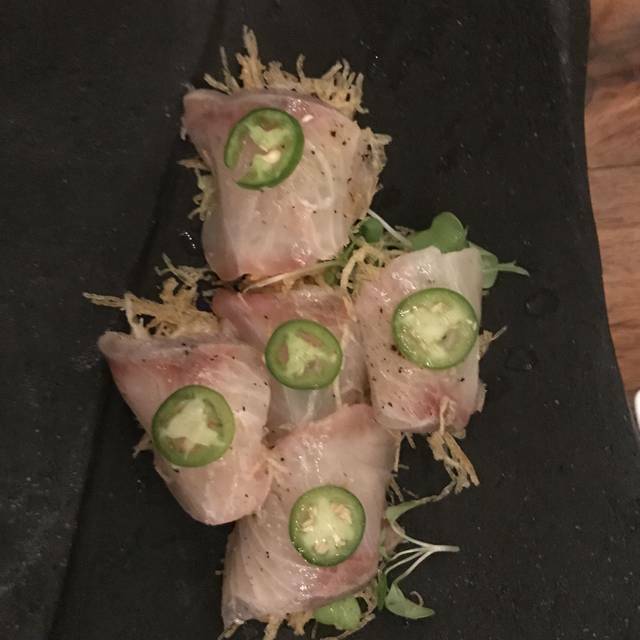 In my photo, it is featured a yellow tail with jalapeno with thin crunchie edible filaments that added texture to the taste. It was Excellent! But, what really blew my socks off were the Peking Duck tacos. Those were simple a melting in your mouth dish with an authentic chinese roasted duck taste. Simple a SUPERB taste. Putting the prices completely aside, as the prices are what you would expect in a Las Vegas Hotel. The sushi is beyond sub-par. Extremely mediocre pcs of nigiri and bland rolls. The sushi comes out of the kitchen as well, as if to hide the freshness and specialty. Stick with the hot food here but regardless, you will be underwhelmed. The low YELP ratings are spot on. We went here for a pre-show dinner while we were in Vegas. We were warned about the pricing before making the reservation. While the menu is a little pricey, it is not more expensive than any other top tier sushi restaurant we have tried in the past. And that being said, the food is well worth the price. The fish of course is top quality, but the sushi rice is what makes it so great. Additionally, the drink selection is diverse and unique. Lastly, the service is excellent. Our waiter made great recommendations and made sure we had an outstanding experience. If you love good sushi, I would highly recommend this restaurant while you are in Vegas. Absolutely my favorite Sushi in Las Vegas. In addition to some of the best sushi, the Tempura and Chicken Yakatori are awesome. The place is super modern, bright and clean. Always makes me feel my food is the same. Service was terrible and so was the value for money. Choose on of the other sushi places on the strip. The fish was not fresh and the food just not that great. The server was nice but not what you would expect at a chef with Michelin stars. Fresh and delicious sashimi and sushi with great waiter service. The sommelier had a little attitude when my friend asked a couple of questions about wine selection. Otherwise, it was a great birthday dinner. Although the quality of the sushi was quite good, it's just not acceptable to eat expensive sushi like this without seeing the chef preparing the fish. Simple as that. Food and service was good but atmosphere was not up to par. Strange lighting, very dim. Nothing special about the decor, it actually takes away from the experience. Probably won't be back. Food was good. Cocktails were good. Service was amazing. A little overpriced. Noriko was a fantastic host and made great suggestions as to what sushi selections would stimulate our tastes as well as wonderful cocktails. I would recommend and ask for her every time we visit Barmasa! Food was stellar. Service not so much. On top of that, my date had sun in her eyes and not really handled the way I would (they moved a tree over). Although pricy, excellent food and lovely ambiance. It was our best meal in Vegas this trip. Especially recommend the sushi canapé and the duck fried rice. I really enjoyed my meal here. The waiter's recommendations were excellent. I love the Japanese beer selection. It's pricey, but the experience is worth it. I only wish the tables weren't immobile. I would have liked to adjust the distance from the booth. Great food at reasonable (for Vegas) prices. Excellent service. Will definitely be back.